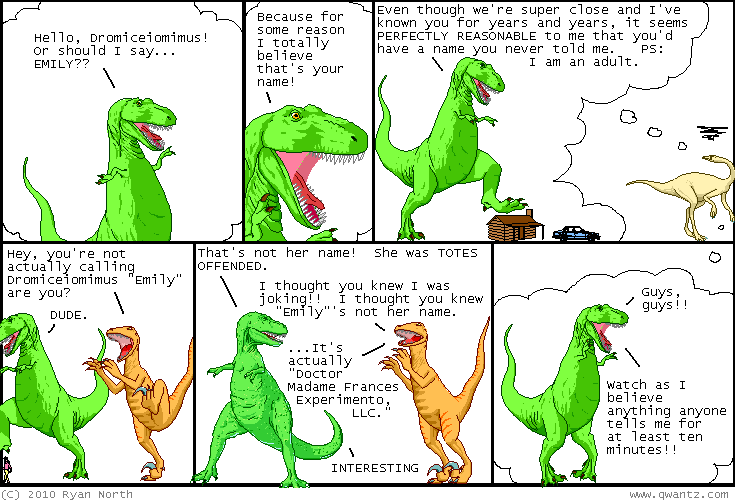 Dinosaur Comics - May 19th, 2010 - awesome fun times! May 19th, 2010: So I had hoped against hope that Joel (of The Sickest Page Ever) would somehow read my comic and email me and say "HEY RYAN, JOEL69 HERE! THANKS FOR REGISTERING SICKESTPAGEEVER.COM AND POINTING IT TO MY SITE! A CHAMPION IS SOMEONE WHO GETS UP, EVEN WHEN HE CAN'T. NO FEAR." - but alas, no such luck. I am forced to conclude that either in the past 10 years Joel has developed past No Fear (impossible!) or somehow he's not a reader of my site (POSSIBLE??) Either that, or he is shy and believes quiet appreciation is sufficient thank you for a good turn (I believe this to be the most probable of all scenarios).